A project that gained steam in Ottawa's local scene over the better part of 2014, Flying Hórses' music is emotionally rooted in the memories and innocence of childhood. Ruminating on these thoughts and feelings had the crowd lost in reflection as the duo of multi-instrumentalist Jáde Bergeron and cellist Raphael Weinroth-Browne were joined by horn player JF Beauchamp to celebrate the release of their debut album Tölt, enrapturing the audience with their incredibly cinematic, evocative compositions. Cranking a number of small music boxes before taking her place onstage, the gentle lilt of Bergeron's keys acted as something of an emotional guide through a series of waltzes, complemented excellently by her bandmates. Weinroth-Browne, an accomplished local cellist, remained a force onstage throughout the evening with flawless technique and impeccable phrasing. Beauchamp was more than effective in using both trumpet and flugelhorn as textures rather than dominant instruments, gently integrating his soft brass playing with long delays and reverb created by a small array of pedals. 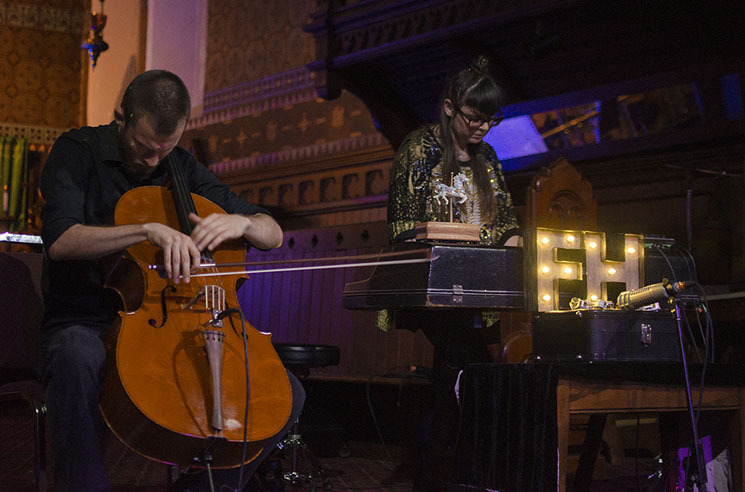 The set reached its emotional climax as Weinroth-Browne vigorously bowed his distorted cello before clicking his pedal off, filling the church with the twinkle of Bergeron's music box one final time.